Campsis radicans.Plant Resources Center and Bio406d at the University of Texas at Austin.bio.utexas.edu (Accessed 4/2014). Campsis radicans is a woody vine to 10 m long, bark on older stems yellowish-gray, shredding, younger stems smooth, pale brown; stems several from base, twining, short aerial roots at nodes adhere very strongly to climbing surface (Scheper 2007); new growth green; winter leaf scars with one central vein scar (Harlow 1946); may cause slight skin irritation when handled (Russell et al. 1997). Leaves opposite, pinnately compound, leaflets opposite, 7-15, 3-7 cm long, 1-4 cm wide, egg-shaped, tip abruptly long-pointed, base abruptly contracted and extending down leaflet stalk, veins impressed above, margin coarsely, irregularly toothed. Flowers bright red-orange to pale orange, tubular, trumpet-shaped, slightly bilaterally symmetrical, 6-8 cm long, 2 cm wide, tube slightly curved, petal lobes 5, rounded, much shorter than tube, slightly unequal, calyx tubular, with 5 short, pointed teeth; stamens 4, shorter than corolla, ovary superior (Yatskievych 2006); inflorescence of dense, flat-topped unbranched clusters (corymbs) of 2-5 flowers; pollinated most effectively by ruby-throated hummingbirds, also visited by honeybees, bumblebees, and Halictid bees. Visited occasionally at night by Sphingid moths. 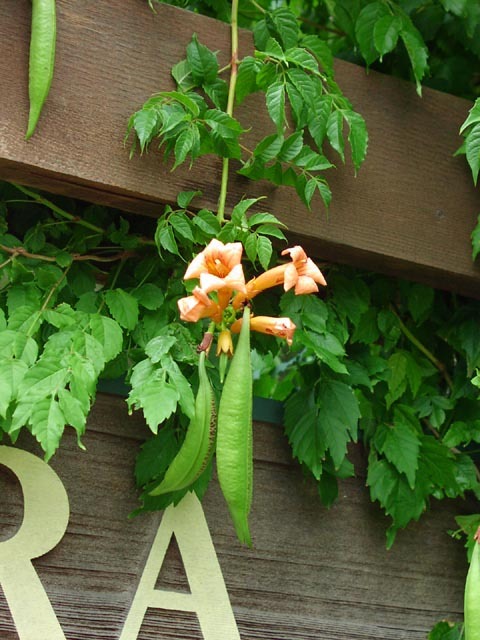 Orioles often steal nectar by slashing base of petal tube (Bertin 1982); blooms June-July. Fruit green, becoming dry, 10-18 cm long, 2-3 cm wide, pointed at both ends, an elongate pod, splitting open along both ribs to release 300 or more flat seeds winged at both ends; fruits Sept.-Oct.. Pods often attacked by beetle or fly larvae that damage or destroy many seeds. Seeds wind dispersed. Origin: Native to New Jersey and south through the Gulf Coast but naturalized as far north as Canada (Scheper 2007; USDA, NRCS 2006). Habitat: Open, second growth, edges, soil pH 4.9-6.8, tolerant of drought and fire; intolerant of anaerobic soil, salt, shade (USDA, NRCS 2006). Notes: Grows aggressively and may be invasive under some conditions. Attractive to some ants (Scheper 2007).